Pink Ink and Polka Dots: A Teacher's Plan: 101 follower giveaway. A Teacher's Plan: 101 follower giveaway. Mrs. M is having a giveaway for reaching 101 followers on her "A Teacher's Plan" blog. I have to say that I am the proud owner of a customized lesson plan that I won in a giveaway a few months ago. Everyone at work is jealous, lol! So, I really hope I win this one so I can gave a matching set! You should click below to enter now! A Teacher's Plan: 101 follower giveaway. 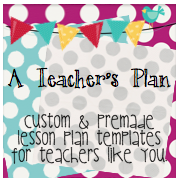 : "To celebrate reaching 101 followers I am going to giveaway one of my premade lesson plan templates. So if there was one that you were intere..."